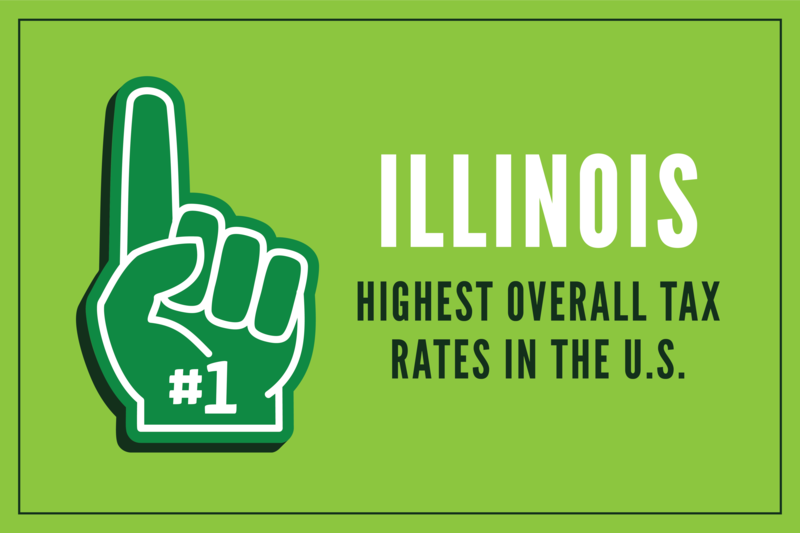 A study released by WalletHub last week found that Illinoisans pay the highest combined tax rate of all the states. Now Governor Pritzker is proposing a Constitutional amendment which would give the same Springfield politicians who created this mess a blank check to raise taxes once again. The first step in this process is for the House of Representatives to vote on the proposed amendment to create a graduated income tax. I will be voting no. Right now, according to the WalletHub study, the effective total state and local tax rate on a median household in Illinois is 14.9%, well above the national average of 10.76%. The Governor has proposed raising more than $250 million in taxes on Illinois families and businesses next year, and is also promoting a tax increase of $3.4 billion on top of that. There is a lot of talk floating around about how this unfair graduated income tax proposal will reduce taxes for some Illinoisans. The truth is that this is just talk. If the specific tax rates are not clearly spelled out in the Constitutional amendment, all we would be doing is giving politicians a blank check to alter rates and brackets however they see fit from year to year. Springfield politicians have raised income taxes twice in the last eight years, and yet we are still billions of dollars in debt. Illinois families already pay the highest state and local taxes in the nation, and now some politicians want us to trust them again with a blank check. If you have seen the national headlines in the past few days; or if you remember some recent headlines here in our district; you know that flooding is a serious threat to many communities. This week, the National Weather Service is observing Flood Safety Awareness Week in an effort to make Americans aware of the dangers that flooding can pose, and what steps they can take to protect themselves. Flooding causes more damage than any other weather disaster in America, averaging around $8 billion every year. Floods also claim about 90 lives each year. But there are steps you can take to protect your safety and your property from flooding. As with any threatened disaster, the first step is to create a disaster plan for your family or your workplace. You should review your insurance policy to find out if you are covered for flood damage, and keep a list of personal property someplace safe. Do not attempt to walk, swim or drive through floodwaters: as little as six inches of flowing water can knock you off your feet. Always keep children away from floodwaters and storm drains. When driving near floodwaters, remember this advice: Turn Around, Don’t Drown! For the past year, I have been working with local mayors and county officials, emergency managers, state agencies and conservancy districts to provide flood mitigation and prevention education, provide information about the many resources that are available and the need of being proactive in working together to make things happen more effectively. We will be meeting again this Friday to continue work on this plan. One piece of legislation which this effort has produced is House Bill 2583, which I am co-sponsoring along with Rep. Lindsay Parkhurst of Kankakee County and a bipartisan group of legislators from around the state. This legislation would allow for the expansion of the Kankakee River Conservancy District through a referendum to help address some of our area’s destructive flooding issues. The bill passed the Counties and Townships Committee unanimously on Thursday. Visit the National Weather Service website for more tips on flood safety and awareness. As of the time of this writing, the State of Illinois owes $8,501,725,445 in unpaid bills to state vendors. One year ago, the backlog stood at $8.4 billion. This figure represents the amount of bills submitted to the office of the Comptroller and still awaiting payment. It does not include debts that can only be estimated, such as our unfunded pension liability which is subject to a wide range of factors and has been estimated to be approximately $130 billion. Last Saturday our 106th District Agriculture Advisory Board met at Baby Bulls restaurant in Pontiac. Warren D Goetsch, P.E., the Deputy Director of the Illinois Department of Agriculture was our special guest. We were glad to have Ron Bork, Don Mackinson, Wayne Blunier, Randie Orr, Randy Poskin, Howard Loy, Dennis Haab, Dave Haase and David Treece join the meeting to discuss the priorities of the new Pritzker Administration. The discussion touched on several Ag related issues and topics. It was time well spent. I appreciate all those who attended, and my district office staff David Littlefield and Angel Crawford for hosting the meeting and getting us organized. The Illinois Board of Higher Education (IBHE) reported this month that while many Illinois high school graduates are going on to college, nearly half; 48.4%; are studying at out-of-state institutions. This increase is up substantially from 2002, when it stood at 29.3%. Part of the responsibility lies with the recession of 2009-10 and the resulting budget cuts and increases in tuition. The board also cited the 2015-16 budget impasse as a factor. Illinois public universities are not an affordable option for some Illinois families, as students who stay in Illinois can find themselves with significant student loan debts after graduation. These figures should concern all of us because of the possibility that these high-achieving students will leave Illinois for college and not return, choosing instead to pursue greater career opportunities elsewhere. It is another reason why we need to be improving our jobs and opportunity climate in Illinois. This year marks the 100th anniversary of Illinois becoming the first U.S. state to ratify the 19th Amendment, which ensured that women would have the right to vote in all elections. The first woman elected to the Illinois General Assembly was Rep. Lottie Holman O’Neill (R-Downers Grove). Rep. O’Neill was first elected in 1922 and served in the House and later the Senate until 1963. She is honored with a statue on the second floor of the rotunda in the Capitol building.